In a talk sponsored by the University of Chicago Human Rights Program, Adam Isacson and Maureen Meyer of the Washington Office on Latin America, a non-governmental organization which the Oblates support, said the voices in Washington calling for further buildup of border security mechanisms as part of comprehensive immigration reform are wrong. 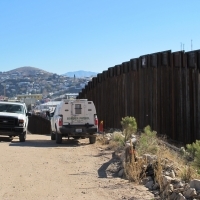 Their year-long study has shown them that what those voices call a “crisis” on the border, a “war-zone” with violent criminals, “illegal aliens” and terrorists streaming over the border into the U.S. does not exist on the U.S. side. The people in actual and terrifying danger are undocumented migrants passing through Mexico and crossing the border. Read more about their findings here.